MAGCO FLEXIBLE GEAR COUPLINGS are distinguished by their MECHANICAL FLEXIBILITY and compensation of misalignment of the connected shafts automatically without any loss of transmitted power during running. These coupling ensure greater flexibility because of their well designed tooth formation generated by INVOLUTE system to ensure uniform tooth PROFILE AND PITCH. 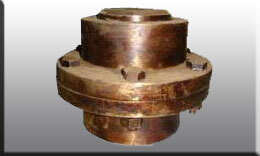 The coupling must be fitted with grease or oil. It is recommended to use grease where the maximum temperature is within 800°C & for temperature above 800°C oil should be use.